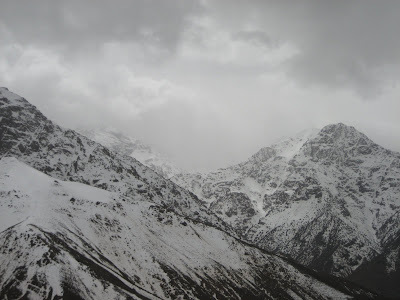 At 13,671 ft, the High Atlas Mountains are... for lack of a better word... tall. Waking up at 7am, I figured that it might be a good day for a hike. 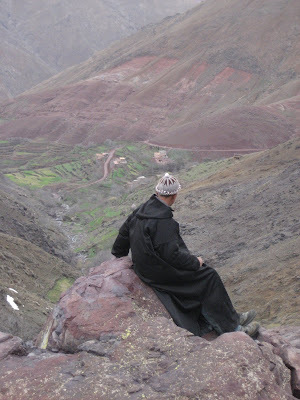 One and a half hours, three grand taxis (a 1970's Mercedes Benz where 7 complete strangers going to the same place all squeeze into the 5 seats), and $3.50 later, I was in Imlil at the base of the High Atlas range. Refusing the local guides and a boy who offered to sell me an $18 map, I found what I thought was the trail I wanted and started hiking up. After 1 hr, the goat trail played out to be just that; only a goat trail. Refusing to admit defeat and hike back down into town, I decided the real trail must be somewhere beyond the steep hillside that was above me. All of a sudden a shepard boy appeared on a rock above me. I spoke him in my best hand signals and shared my cookies. He signaled that the trail I wanted was on the other side of this mountain and that I was an idiot (he didn't actually signal 'idiot', but I could tell he was thinking it). And me without my map or guide. The cross country hiking got harder and harder and in the back of my mind I had the nagging suspicion that at since I was ascending, at some point I would have to descend. Sure enough when I got to the top of the canyon wall and hour later, I was looking at a lot of down. A lot of steep and technical snow covered down. And me without my map, guide, crampons, snow pants, rope and common sense. Hiking through in knee deep snow, I see the actual trail in the distance. The shepard boy was right...I am an idiot. When I finally got onto the trail and completed the hike I was utterly exhausted. I have never been so excited to be the 6th passenger in a beat-up old Mercedes Benz taxi. On the way back to Marrakesh we all took turns with who got to lean back in the seat. That sounds like a lot of work. I bet you ordered TWO sheep-head's soups for dinner! Okay, August, we just got your card today. We are ALL concerned about you, except for Dr. V who thinks you should get paid for all the work you've done on your blog about your great adventure. Great photos, to say the least. Now, Mrs. Cline says to COME HOME !!! Thanks for the invite Pete. I would love to visit spain, but the plane to Cairo awaits. Have a great vacation and pour some spanish beers out on the ground for me, your traveling homie.